“My name is Simon Wheatcroft, I’m an ultramarathon runner, father, and Glass Explorer,” explained the 30-something man on stage at Wired’s annual London conference. Anyone who’s ever taken on the momentous challenge of running a marathon will know that the 26.2 miles of exertion on race-day is only a small part of the achievement. The months of (blood), sweat and tears that go into training for the occasion is where the real hard work lies. Now, imagine the final distance you’re training for isn’t 26.2 miles. Imagine it’s 100 miles or more. And imagine having to pound the pavements on your own, without the benefit of vision. Only then can you appreciate what Wheatcroft has achieved in the past few years. Wheatcroft was diagnosed with a degenerative eye disease at 13 that led to him becoming legally blind by the time he was 17. Around 10 years later, he took up running, a hobby that has blossomed with a little help from mobile technology. This is exactly what Wheatcroft did. Over the past four years or so, Wheatcroft has run solo by learning the environment around him, aided by audio cues from Runkeeper on his phone, and in more recent times, through strapping Google Glass to his face. So for the next while, slightly deceptively, he began to learn to run the open road. He learnt what it felt like underfoot, and paired that with the distance on Runkeeper. Grass, bushes and other environmental objects were used by Wheatcroft to help him navigate, but obviously things like road signs and lampposts were problems – “you have to learn where they are by running into them. You don’t make that mistake a second time,” he adds. Things progressed, and after telling his wife what he’d been doing, she eventually got on board with the idea and Wheatcroft started to reach distances of 10 miles. He then entered a 100 mile race, one of a number of distances that fall under the ‘ultramarathon’ banner, for which he had six months to train. Six weeks later, he turned out for the race in the hilly Cotswolds. He got to 50 miles and broke down, but didn’t quit. He pushed himself on to 83 miles until he could no longer stand, and was pulled from the race. While he has run all sorts of official races, from 5km to half-marathons and beyond, he has never run an actual organized 26.2 mile marathon. “There was only one marathon I ever wanted to run – and that was New York,” he explained. 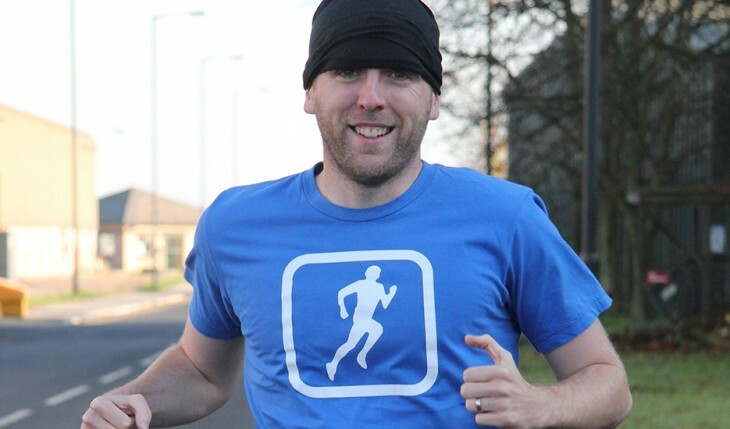 In a couple of weeks time, Wheatcroft will compete in the New York Marathon. But before that, he’ll run from Boston to New York – 206 miles – documenting every step of his journey with Google Glass. “Boston is the home of Runkeeper, which is what made this possible – if it wasn’t for them, I’d never have started to run,” he explained. He’ll use Google Glass to stream and document the endeavor, and there will be live GPS tracking. The use of Google Glass is interesting on many levels. Yes, it opens things up to broadcasting to the world, but on a practical level it gives Wheatcroft easy access to his phone’s functionality, which means he can keep both his hands free. While Wheatcroft may not be able to see the screen, Glass can provide vital audio cues that serve many purposes. All he needs is the GPS coordinates, to keep on running, and beat everyone else. Sounds easy, right? “I often see technology as an opportunity, a new piece of technology always opens up a new possibility,” he says. Meanwhile, be sure to track Wheatcroft’s progress from Boston to New York here.